As we head into the Christmas Season and all the associated holidays around December, there are always classic movies on TV and one or two cinema Blockbusters out to help us all feel festive. Now, we love a Christmas Movie, but what about those ‘Alternative Christmas Movies’? Now, by ‘alternative’ we mean those films that are ordinary films set at Christmas or include Christmas in some way but it’s not the main focus. It might be a happy childhood memory or it might be that they’re just great films, but we love watching these films more than the traditional Christmas ones! So, here’s our pick of Non-Christmas-Christmas-Movies which we love! Make sure to tell us in the comments below some of your favorites too! 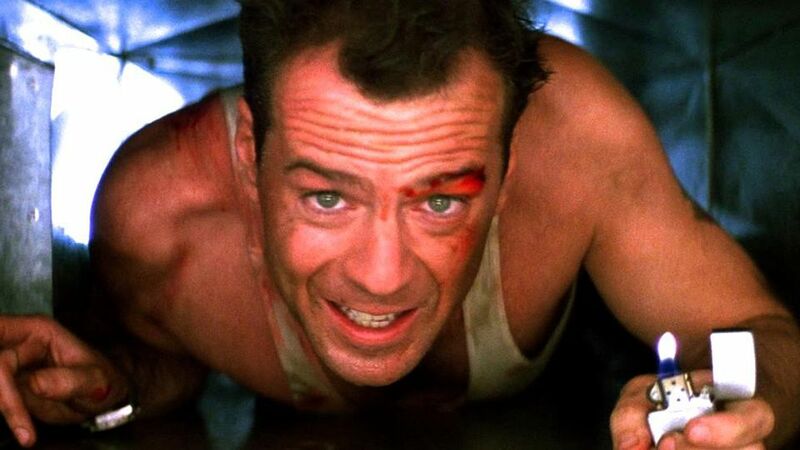 This vehicle for Bruce Willis is the big Christmas blockbuster of them all. Opening in July 1988 you could call it Christmas in July. It’s about a heist gone wrong and it happens at Christmas, but it’s NOT a Christmas movie OK! In the run-up to the Festive Season, we see upper-crust executive Louis Winthorpe III (Dan Aykroyd) and down-and-out hustler Billy Ray Valentine (Eddie Murphy) become the subjects of a bet by successful brokers Mortimer (Don Ameche) and Randolph Duke (Ralph Bellamy). Louis gets so down on his luck he dresses as Santa. BUT it’s not a Christmas movie! OK ‘Santa’ is in the title and the main character plays a Mall Santa that robs the Mall after closing time. But it’s still not a traditional Christmas movie though, is it? When the CEO (Jennifer Aniston) tries to close her hard-partying brother’s (T.J. Miller) branch, he and his chief technical officer (Jason Bateman) must rally their co-workers and host an epic office Christmas party in an effort to impress a potential client and close a sale that will save their jobs. But it’s about the party, its NOT about Christmas! While the holiday season represents the most magical time of year, ancient European folklore warns of Krampus, a horned beast who punishes naughty children at Christmastime. When dysfunctional family squabbling causes young Max (Emjay Anthony) to lose his festive spirit, it unleashes the wrath of the fearsome demon. As Krampus lays siege to the Engel home, mom (Toni Collette), pop (Adam Scott), sister (Stefania LaVie Owen) and brother must band together to save one another from a monstrous fate. This is a Horror Movie, so it’s no way a Christmas movie. This is actually a movie about how two rival sets of people pronounce the name of St Louis… OK we give in, it’s sort of a Christmas movie, and it launched one of the most beloved Christmas songs of all time, “Have Yourself a Merry Little Christmas”. There’s even a clip of Judy singing the song on TV being used in an actual Christmas Movie, ‘The Family Stone’. We’re not crying, you’re crying! This is one of the most hotly debated films of all time! Is it a Halloween film or is it a Christmas film?! This is one of Tim Burton’s best films, made in the beautiful art form that is stop motion. In it Jack Skellington, king of Halloween Town, discovers Christmas Town, but his attempts to bring Christmas to his home causes confusion. Whatever you choose to watch this Holiday Season, have a very Merry Christmas, and Happy Channukah too! Love from all of us at Queer Forty. The “Christmas season” and “related” holidays ?? Wow.